The pop-up button is totally useless once you swap to Silvia lights. It’s an on/off switch as well, which makes it a perfect candidate for fog light work. There are different options at this point to make this work. 1- You can drive the switch with its current power source. This will put no draw on existing systems, you won’t have to open your interior up, but you will have to make sure you remember to turn the lights off as the power feed is not an ignition switched source. They will stay on if you leave the switch depressed and your car off. 2- Switched voltage. I used the Red/blue wire coming into the switch to drive my fogs. You only have fogs when you turn your lighting switch to 1 (no headlights) and have the button depressed, but now you can set the switch and forget it. The drawback is that the illumination system shows a minor, minor amount of dimming. 3- Use the switch to drive a relay. This is the most desirable, but requires the most work. You would wire the switch up like in the previous option, but it would drive a Normally Open relay to supply power to the fogs. You could even use the old pop up switch power supply to be your switched power on the relay. This digram has all the plugs of interest highlighted. The pop up motors are both supplied by a Brown(BR) wire that comes directly off the pop up switch. The Switch’s on/off function is supplied by the Purple(PU) wire and completed by the Brown wire. The relays are easy to get ahold of, the bases will need to be pulled from a car. First, remove your headlights and fish out your fog light plugs. If you have no plugs, you can make one out of spade connectors of the right size. Find the old pop up harness and open it up about halfway. Inside you’ll find the Brown supply wire and the Black ground. 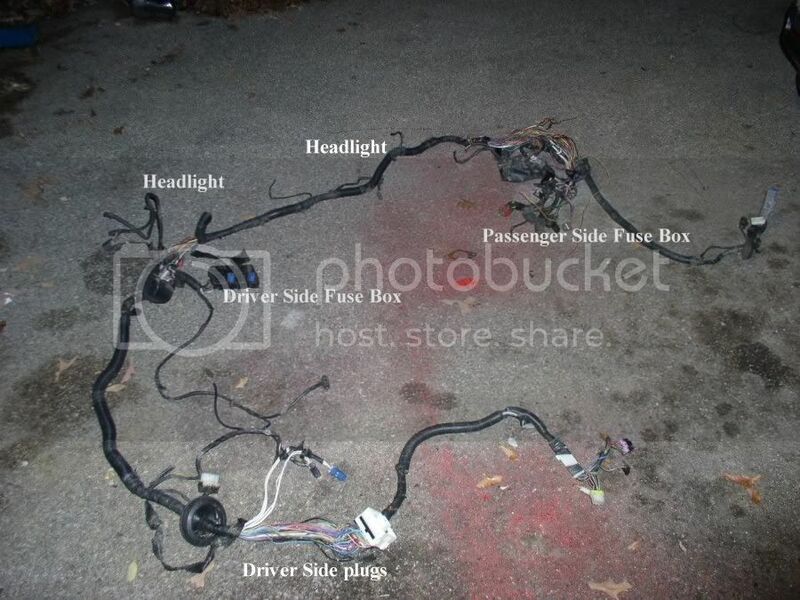 Wire your fog light harness into these two. I prefer doing it this way in the random case you might need to swap back to pop ups, you didn’t totally remove the plug. If you want to remove it, I suggest cutting the plug, make your solder connections for the fogs, and then shorten the other wires to varying lengths to avoid shorts in the system, then wrap the whole mess. Then remove the gray relay labeled ‘H/L Ret Cont’ from the passenger fuse box. If you don’t remove it, this relay, as an auxillary supply to the pop up motors, will energize the fog lights when you turn the headlights on. To dig in deeper, you’ll have to poll the gauge bezel shroud in the interior of the car. You need to get to the back of the pop up switch to rewire the voltage feed. Once you’ve gotten to the switch’s plug, you’ll need to tap the Purple wire into the Red/Blue (R/B). The Red/Blue is part of the illumination system. When you turn the lighting switch to the 1 position, the switch feeds a Red/Blue wire which branches and goes to every par of the car that lights. Marker lights, combo lights, gauge cluster illumination. You get the idea. By tapping off this wire, you supply voltage to the fogs only when you turn your marker lights on. Simply cut the Purple wire and tap it into the Red/Blue. Now you have a switch that can be turned on, but will only supply the fog lights once the marker lights are activated. I like this solution as it makes the fogs independent of the headlights.